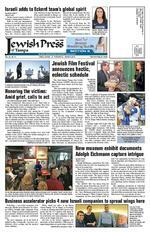 JEWISH PRESS of TAMPA PAGE 17 FEBRUARY 23 MARCH 8, 2018 Limited time oer. 2018 AT&T Intellectual Property. All rights reserved. AT&T, the Globe logo, DIRECTV and all other DIRECTV marks contained herein are trademarks of AT&T Intellectual Property and/or AT&T a liated c ompanies. All other marks are the property of their respective owners. IV Technologies Inc.Learn how to get an iPhone 8 on usAsk an as sociate for details.855-419-4103NRO PD T 0118 5323 E Theres no cost to you! CALL (844) 479-9559 rrrrf rntbr bbbrn rbrbfreerrbbrr r r br rr rr brr brb rb HONORINGwith special needs kids. Another volunteer at the center, Gina Montalto, also was killed in the shooting. Jeb Niewood, president of The Friendship Initiative, remem bered Guttenberg as a genuine person who loved helping others. In her free time, Guttenberg also loved to dance, and she was involved with a local dance studio, according to Facebook posts. Of all the Jewish victims of the shootings, Jaimes family has perhaps been the most outspoken about the need for legislation to prevent another school massacre. Jaimes father, Fred, spoke at a CNN town hall in Sunrise on Feb. 21 and told Sen. Marco Rubio that his comments since the shooting and the need for gun control are pathetically weak. My daughter was hunted last week She was massacred. I am enraged, he told Rubio. Look at me and tell me that guns were the factor in the hunting of our kids in this school this week. Rubio responded that guns were a factor but said the issue of gun control is a complicated one, and when pushed by a student, refused to say he would not stop accepting contributions from the NRA. The Feb. 18 funerals for Jamie and another victim, Alex Schacther were moved to a Fort Lauderdale hotel to accommodate more than a thousand mourners. Alyssa Alhadeff Alyssa Alhadeff, 14, was a mature, laidback girl who loved soccer and made friends easily. She the school soccer team, earning newspaper coverage for her achievements on Shes the sweetest, Alhadeffs grand mother, Vicky Alhadeff, told Miamis Channel 7 News. Shes a big soccer player, very smart, shes in track. Shes very popular, a very beautiful girl. Oh my God, shes my life. How could I not love her? Shes my granddaughter. Honor her legacy with positive actions and be her voice, Rabbi Shuey Biston of the Chabad of Parkland told those who came to remember he son, according to the Florida Sun-Sentinel Mourners spilled onto the sidewalk of Star of David Memorial Gardens Cemetery and Funeral Chapel in North Lauderdale on Feb. 16. They included fellow students who remembered Alyssa as an excellent student and athlete who spoke of attending law school, according to the Sun-Sentinel Her mother, Lori Alhadeff, who in an interview with CNN, begged President Donald Trump to take action to prevent future mass shootings. At the CNN town hall a few days later, she expressed anger and frustration. I am tired of people doing nothing, Alyssa had attended Camp Coleman in Georgia, a Reform Jewish camp, for one summer, and was planning on returning this year. Staff there remembered her as being like an angel, always happy to help out and quick to adjust to a new environment. A soccer scholarship has been set up in her memory through GoFundMe. Meadow Pollack Meadow Pollack, 18, a senior, had planned to go to Lynn University in nearby Boca Raton next year. Her father, Andrew Pollack, attended a listening session with President Trump at the White House on Feb. 21 and told Trump that it must be the last school shooting. My daughter is in King David Cemetery, Pollack said. Never, ever will I see my kid, its an eternity. Pollack, surrounded by his three sons, asked the president, How many schools, how many children have to get shot? Pollack called for increased security at schools, noting that the 9/11 terrorist attacks in 2001 triggered immediate enhanced protections for airliners, while despite a succession of school shootings these facili ties remain vulnerable. He advised against litigating gun laws for now, saying the issue was too divisive. Its not about gun laws right now thats At Meadows funeral Feb. 16 at Temple Kol Tikvah, her dad talked about the thoughts that haunt him. You killed my kid. My kid is dead goes through my head all day and all night. I keep hearing it over and over, he said, accord ing to a Sun-Sentinel report. I have always been able to protect my family. Our kids should be safe but my princess wasnt safe. Rabbi Bradd Boxman called on those who were present to do an act of kindness in Meadows memory. We must carry Meadows love forward and not let it die in a pine wood box, Rabbi Boxman said, according to the Associated Press. Alex Schachter, 14, was a member of the schools marching band and orchestra, playing baritone and trombone. I felt he really had a bright future on the trombone, Alexander Kaminsky, director of bands at the Parkland high school, told the Sun-Sentinel. The Miami Herald reported that remembrances at the Feb. 18 funeral focused on his love for movies, his humor and his passion for the high schools marching band as well as the secret ingredi ents in his special smoothie. A Go Fund Me page was set up by Alexs family for a scholarship. In an effort to continue his memory, this scholarship is being created to help other students experience the joys of music as well as fund increased security at schools. Please help keep Alexs spirit alive, the page said. The money raised will be sent to the Stoneman Douglas Marching Eagles. Alexs father read a poem at the CNN town hall meeting that his son had written that likened life to a rollercoaster ride, with the rider never knowing when it would stop. Scott Beigel Scott Beigel, 35, was a geography teacher and cross country coach at the school. He was also a longtime counselor at Camp Starlight, a predominantly Jewish camp in Pennslyvania. Beigel is credited own life to save students by opening his classroom door to students looking for a place to hide. He was shot while closing the door behind them. One of the students, Kelsey Friend, recounted how Beigel let her and other students into his classroom and then attempted to lock the door. Friend said she would likely not be alive had Beigel not opened the door for her and called Beigel a really amazing teacher. Linda Shulman, Beigels mother confronted the NRAs Dana Loesch at the CNN town hall, demanding to know: Why are my sons unalienable rights not protected as Hundreds of family, friends, students and colleagues attended the Beigels funeral on Sunday, Feb. 18, at Temple Beth El in Boca Raton. Camp Starlight, recounted a chilling conversation when they were watching cover age of another school shooting. If he ever was the victim of a school shooting, Beigel said he didnt want Gossler to talk about the hero stuff, Gossler related at the funeral Nevertheless that was the word being used to describe Beigel. In a Facebook post, Camp Starlight, called him a beloved friend and hero. I am not at all surprised to hear that he endangered his own life to save others, wrote Liza Luxenberg, a friend from the camp. He has always been a hero to me as a friend and now unfortunately the rest of the world gets to learn of his heroism in this tragedy. A Scott Beigel Memorial Fund has been set up to fund scholarships to the camp. Alyssa Alhadeff Meadow Pollack Scott Beigel valorous woman excerpted from Proverbs and traditionally sung on Friday night, as well as Ecclesiastes. That is why I always strive to do what is right, what is best, what will help people. This is why this message is impor tant regardless of your personal faith because I want my children and grandchildren to always be able to look back with pride someday at my legacy as they continue to pass down our faith and legacy of public service. Israel told the Sun-Sentinel that he attends the Parkland Chabad, and he is comfortable in churches as well as synagogues. His wife, Susan, is Christian, and they raised their children in both religions. I am Jewish, he told the Sun-Sentinel. Susan is Christian. Like most families with parents of different faiths, we raised our children with extensive exposure to both our faiths. The triplets were all bar/bat mitzvahed. Now that the triplets are adults, they each have the free choice to decide their own faith. PAGE 18 JEWISH PRESS of TAMPA FEBRUARY 23 MARCH 8, 2018 Tampa Bay Jewish Film Festival ScheduleWEDNESDAY, MARCH 21 OPENING NNIGHT Bye Bye GermanyBryan Glazer Family JCC Cocktail hour 6 p.m., Theater opens 7 p.m.Bye Bye Germany is an awardÂ THURSDAY, MARCH 22 HHILLSBoORoOUGH CoOUNTY And Then She Arrived Villagio Cinema of Carrollwood, 11 a.m.Â And Then She Arrived Â Â Mr. Predictable Â The Womens Balcony Bombshell: The Hedy Lamarr Story Villagio Cinema of Carrollwood, 1 p.m.Bombshell Sammy Davis Jr.: Ive Gotta Be MeAMC Classic Centro Ybor, 5 p.m.Â Sammy Davis Jr.: Ive Gotta Be Me Â Heather Booth: Changing the World Bryan Glazer Family JCC, Theater 1, 6:30 p.m. Heather Booth will lead an open LongingBryan Glazer Family JCC, Theater 2, 8 p.m. Â Longing. PPINELLAS CoOUNTY The Last Suit Largo Central Park Performing Arts Center, 7 p.m.A dessert reception will follow the movie. Sponsored in partnership with Federation of Jewish Mens Club and Men of Reform Judaism. FRIDAY, MARCH 23 HHILLSBoORoOUGH CoOUNTY The Cakemaker Villagio Cinema of Carrollwood, 1:30 p.m. Cake and coffee will be offered Budapest Noir AMC Classic Centro Ybor 10, 5 p.m.Â Budapest Noir PPINELLAS CoOUNTY And Then She Arrived AMC Classic Palm Harbor 10, 11 a.m. Budapest Noir AMC Classic Palm Harbor 10, 4 p.m. SATURDAY, MARCH 24 HHILLSBoORoOUGH CoOUNTY The Testament AMC Classic Centro Ybor 10, 7:30 p.m. The Testament PPINELLAS CoOUNTY In Between AMC Sundial 20, 7:30 p.m. An Israeli Love Story AMC Sundial 20, 9:30 p.m.
JEWISH PRESS of TAMPA PAGE 19 FEBRUARY 23 MARCH 8, 2018 rfntbrtrf rfntbrtfrttf ttrtrrtft ntrfftf rf rfnftfbfrn tbrrrf n nr fft fr frrbfbrfr trfftf t ntt rfbf trftbrtt rrtfrrtrftbrtt rfftrftbrtt rfbff f tb brt tfrf trrf bf f n bf t rrfb ftf rf f FESTIVALThe year is 1947. Eighteenyear-old Margalit lives in a settle ment in northern Israel. One day she meets 24-year-old Eli Ben Zvi. She tries to get close to him, but things dont go so smoothly. He has a girlfriend and is busy with the dramatic events preceding the birth of Israel. Slowly the barriers come down, Eli discovers Margalit and they move in together. They set up a date for their wedding, but Israels harsh reality intervenes. Admission: $10 SUNDAY, MARCH 25 HILLSBOROUGhH COUNTY Scandal in Ivansk Glazer JCC, Theater 1 10:45 a.m.In the small Polish town of Ivansk, most of the Jews were killed by the Nazis, and the headstones in the Jewish cemetery were plundered for construction purposes. A group of descendants of Ivansk Jews restore the towns cemetery, retrieving what headstones they can. When they commission a plaque that includes the word collaborator, a national scandal is unleashed. This eyeopening documentary strives to understand why much of the nation wont accept collaborator to describe Polish people who aided genocide of Jews. Admission: $10Dreaming of a Jewish Christmas Glazer JCC, Theater 2, 1:30 p.m.In an irony of ironies, it was Jewish immigrant outsiders Ir ving Berlin, Mel Torm and many as a secular and inclusive cultural phenomenon. Penning such yuleLet It Snow and Rudolph the Red-Nosed Reindeer, these artdays through musical merriment. A panoply of performers delivers renditions of these beloved melorestaurant, while musicologists, religious leaders, comedians and others add insights into the contradictory and poignant relationship American Jews have with The Most Wonderful Time of the Year (also written by a Jew). Admission: $10. Kosher Chinese buffet lunch beItzhakGlazer JCC, Theater 1 2:30 p.m. Â examines the life and glorious music of Israeli-born Itzhak Perlman, widely considered the greatest living violinist. Ar chival materials and performance clips, including a breakthrough appearance on Â Â at age 13, combined with behind-the-scenes moments of the venerated artist. Perlmans musical discipline contrasts with an intimate view of his home life, as a modern Jewish family embraces its heritage in a changing world. Admission: $10Heading Home: The Tale of Team IsraelGlazer JCC, Theater 2, 4 p.m. Heading Home charts the under dog journey of Israels national baseball team competing for the the worlds best in 2017, eligible to play in the prestigious international tournament. Their line-up included several Jewish American major league players, most with a tenuous relationship to Judaism, and never having set foot in Israel. Their odyssey takes them from Tel Aviv and Jerusalem where they are greeted as heroes, to Seoul where they must debunk their has-been, wannabe reputations. raels roster) Alex Jacobs after Admission: $5 for kids, $10 for adultsThe People vs. Fritz Bauer Glazer JCC, Theater 1, 6 p.m. postwar 1950s, Germany grows increasingly apathetic about confronting its recent past. Against this backdrop, the implacable Attorney General Fritz Bauer (Burghart Klaubner) is committed to holding leaders of the Third Reich to account. He is stymied at every turn by authorities with Nazi ties, now in top government positions. While slandered in the court of public opinion by foes seeking to silence him, the tenacious Bauer pursues a forbidden alliance with Israeli spy agency Mossad to apprehend Holocaust mastermind Adolph Eichmann. Admission: $10 to sell-out this year, so pre-pur chase of festival tickets is suggested at www.tbjff.or g. For more the ad on Pages 10-11 or go to the website. The 2018 festival is co-produced by Tampa sponsored by the Florida Department of State Trust and Sara and David Scher. To become a corporate sponsor or patron of the Tampa Bay Jewish Film Festival, call (813) 769-4725 or visit the website. JEWISH PRESS of PINELLAS COUNTY/TAMPA FEBRUARY 23 MARCH 8, 2018 PAGE 2B Jewish Wedding Guide Jewish Wedding Guide Jewish Wedding Guide Ma Z el Tov! MaZel Tov! BEGIN YOUR JOURNEYr CALL: 813-575.7522522 N. HOWARD AVE TAMPA 33606 WWW.BRYANGLAZERFAMILYJCC.COM/WEDDING | INFO@BGFJCC.COMCUSTOM MENUS FLORAL DECOR LIGHTINGOur professional team is committed to making your wedding experience one to truly remember.TAMPAS PREMIER EVENT VENUEImages courtesy of Richard Harrell Photography & Sea Shack Photography. JEWISH PRESS of PINELLAS COUNTY/TAMPA FEBRUARY 23 MARCH 8, 2018 PAGE 5B Jewish Wedding Guide Jewish Wedding Guide Jewish Wedding Guide Ma Z el Tov! MaZel Tov! JEWISH PRESS of PINELLAS COUNTY/TAMPA FEBRUARY 23 MARCH 8, 2018 PAGE 6B Floral Design Studio 6700 Central Ave., St. Petersburg local and worldwide delivery Weddings Events Bar/Bat MitzvahsRedman Steele 727.343.1020 RedmanSteeleFlorist.net 16035 Tampa Palms Boulevard West(In the City Plaza, next to Publix)Steven Rothfarb, OwnerQuality since 1987(813) 977-4841www.framebyframegallery.comWe specialize in the creative preservation of Wedding photos, Bar & Bat Mitzvah invitations and memorabilia! SM LET US CUSTOM FRAME YOUR SIMCHA MEMORIES SM LET US CUSTOM FRAME LET US CUSTOM FRAME YOUR SIMCHA MEMORIES YOUR SIMCHA MEMORIES YOUR SIMCHA MEMORIES YOUR SIMCHA MEMORIES LET US CUSTOM FRAME YOUR SIMCHA MEMORIESBy JORDANA HORN Kveller via JTA news servicePremarital counseling As a prerequisite to marriage, the Catholic faith requires a course of premarital counseling set by the church called pre cana. No equivalent really exists in Judaism, but I did appreciate it very much when our rabbi offered an opportunity to sit and meet with him a few times to discuss how we wanted our lives to look as a married couple. (I would also love to go back in time and see what we said, since I am sure we didnt really think we would have six kids, but thats another story.) Ask your rabbi if you can do the same. Its a good way to talk about things you may not have already discussed, like how religious you want your life to be, how you want to raise any kids, how you want to handle money and so forth. Genetic screening Heres another one you may not have discussed: genetic screening. Before marrying, get tested for Jewish genetic diseases. Most people get reassuring results, but even if you both test positive as carriers, there are options to help you have healthy children. Its super common to be a carrier for some kind of genetic disease: One in three Jews is a healthy carrier. The crazy part is you have no idea without testing. lineage subsidized testing for more than 200 genetic diseases. or Mizrahi backgrounds, as well as interfaith couples. You can do the test at home and register online. Consider the paperwork Youre probably going to want a ketubah, a Jewish marriage contract. While I have a rabbi friend who refers to it somewhat pejoratively as an Aramaic document of acquisition, I see it as an opportunity to frame your marriage and mutual Jewish future. In the secular world, you may be considering a prenup. As a Conservative Jew, I am a tremendous advocate of the Lieberman clause, in which both parties to the marriage agree not to withhold a get the Jewish instrument of divorce should the marriage not hold. Including this clause in your ketubah is a statement on behalf of womens rights. There are many websites with ketubah options. Talk to each other band, etc. No one is actually going to recall what card stock you used for the thank you notes or how big your centerpieces were. Take time every day to talk about something not wedding-related. You know, like why you like each other, or a movie you saw. If you can, write a letter to your partner (offer them the chance to do the same for you, but or 10th, anniversary. tween you, dont sweep them under the rug. Talk about the problem. Do you differ on fundamental issues, like whether to send kids to Hebrew school or what you believe, spiritually and politically? If youve got concerns, its not just jitters and even if it were, this is a litmus test for how you deal with stress (and this is just the good kind of stress). If you dont like the answers, you may need to have a more serious discussion that yes, could include postponing or calling off the wedding. Dont compromise your future because you already paid for the caterer. Plan the ceremony The core of the wedding is the ceremony, not the party (I know shocking), so take time to focus on that element. What would make the ceremony more meaningful to you and your partner? When I asked the cantor at our synagogue for traditional wedding music, he gave us a CD of music performed by our synagogues band, and I chose a song and sang it with them as I circled my groom. I will never be able to think about that without simultaneously smiling and crying. Think beyond yourselves Use the kiddush cup your partners great-grandfather brought over from Russia, even though you think its hideous. Use the tallis the entire family has been married under rather youre not making a wedding for Pinterest you are making it for your family, past and future. Honor those people. And, for that matter, honor your guests by making the registry easy to navigate (and easily refundable), the seating comfortable and the food plentiful. Be kind Figure out ways to pay your happiness forward. Write thank yous not only to those who gave you gifts, but to those Be kind to everyone. Give your centerpieces to a nursing home or hospital. Donate a portion of your gifts, if they are monetary. Make sure you tell people how thrilled you are that they took the time to come and be with you to celebrate this milestone in your life, and how you hope they will be there for every special day to come. This article was sponsored by and produced in partnership with JScreen. Kveller i s an online community of wom en and parents sharing experiences of raising kids through a Jewish lens. V isit Kveller.com. JEWISH PRESS of PINELLAS COUNTY/TAMPA FEBRUARY 23 MARCH 8, 2018 PAGE 6B Jewish Wedding Guide Jewish Wedding Guide Jewish Wedding Guide 7 things (you may not have thought much about) to do before the weddingThe ketubah, the Jewish marriage contract, is often created as an original artwork and displayed in the home. By KRISTEN FISCHER CTW FeaturesIntegrating bright reds, greens and yellows popular in the era can be a splashy way to create a Bohemianthemed affair. Just think more in jewel tones and less in the bright Brady Bunch. From the venue to the colors into a one-of-a-kind wedding without going overboard. Even better, an elegant look can still be attained when its done right and this unique palette can work in any season. Bohemian is effortless cohesion, said Lindsay ParrottMasiewicz, owner of P3 Events in Connecticut. In addition to all the upbeat hues, add a little gold into the color palette for a distinctive look. An unforgettable atmosphere take on the motif. To achieve an effortless bohemian vibe, I would start with a patterned tablecloth, something bold and bright with hints of gold throughout, said Parrott-Masie blue or green square charger, then topping it with a round red dinner plate and a goldor yellow-inspired menu on top. Taper candles, submersible LED lights and linens can be the perfect accents to add the color without overwhelming guests with the theme, said Audrey Issac of 100 Candles based in California. If youre looking for a subtler vessels consider colored and textured glass votives and vases for the eclectic look often associated with bohemian inspired celebrations, she says. Boho chic What the bridal party wears can also be incorporated into the color palette. Dresses can also tie into the theme, and Issac suggests letting bridesmaids choose their own Who said the s is out of style? Boho is back Brady From the venue to the ding without going overboard. Even better, an elegant look can still be attained when its done right and this unique palette can Bohemian is effortless co hesion, said Lindsay ParrottWho said the s is out of style? Boho is back AWESOMES A UCE PHOTOGRAPHY INTERNATIONAL TREND REPORTments and bridal bouquet will add interest and natural playfulness, in Washington D.C. Berries are plentiful and come in an array of hues from pale pinks and deep reds to bright greens and icy blues. lushness and complimentary monochromatic tones. also incorporate colors, while ribbons can accent just about anything while featuring engaging patterns. From there, its simple to adopt trends like a candy bar or photo booth just stick to the same hues and youre set. Channel your Megan Velez, Destination Weddings Grouptone of the big day, such as upscale ding, while a more classic wedding requires a formal dress. Give them one or two colors and allow them to take the lead on the hue and overall style, she says. Blues and greens in particular work well with most skin tones; save the brighter colors, such as yellow and oranges, for accents and accessories. Encouraging bridal party members to incorporate a pattern will add to the eclectic vibe. As for the bride, adorning locks and theme. of Destination Weddings Group, a network of wedding planners across the globe. Prefer a traditional veil? Then, see if your wedding party is on board with donning natural blooms, instead. And for the dress, and a touch of lace. JEWISH PRESS of PINELLAS COUNTY/TAMPA FEBRUARY 23 MARCH 8, 2018 PAGE 8B Jewish Wedding Guide Jewish Wedding Guide Jewish Wedding Guide Ma Z el Tov! MaZel Tov! Iagin Yu Wing FEATHER SOUND COUNTRY CLUB2201 Feather Sound Dr. I Clearwater, FL 33762 I 727.498.0005 I www.fscc.club I urruezo@feathersoundcc.comI have been part of the Jewish community and medical community for 29 years and, hands down, second to none Feather Sound Country Club is where you would want to have an Event Of A Lifetime. The food the atmosphere and the ambience are outstanding. Dr. Heidi Goldberg e nly hing e verl s autiful ol oure.